US President Donald Trump has justified his pledge to help China's ZTE "get back into business" after critics claimed he was "backing off". He said the country is working on a "larger trade deal" and the Chinese tech firm buys many parts from the US. 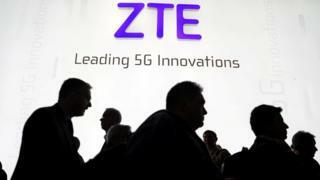 The US had banned American companies from selling parts to ZTE, after it admitted to making illegal shipments to Iran and North Korea. But the US will now consider alternatives to the supplier ban. The concession was welcomed in China and comes ahead of high-level trade talks this week in Washington aimed at addressing an escalating dispute between the world's two largest economies. The Wall Street Journal reported, citing sources, that the reprieve for ZTE was being negotiated as part of a possible deal in which China would lift tariffs on certain US agricultural products, such as ginseng, that went into effect in April. Mr Trump on Monday referenced the trade talks to explain the change. He tweeted: "ZTE, the large Chinese phone company, buys a big percentage of individual parts from U.S. companies. This is also reflective of the larger trade deal we are negotiating with China and my personal relationship with President Xi". Beijing has made resolving the situation of ZTE, which employs about 80,000 people, one of its demands for a broader trade agreement with the US. "We greatly appreciate the positive position of the US on the ZTE issue and are in close communication with the US on the details of the issue," foreign ministry spokesman Lu Kang said. ZTE suspended operations following last month's ban. The firm spent more than $2.3bn on imports from about 200 US companies last year and relies on the parts for its products, which include smart phones and telecommunications equipment. "ZTE did do some inappropriate things ... the question is are there alternative remedies to the ones we had originally put forward and that's the area we will be exploring very, very promptly," Mr Ross said at the National Press Club in Washington. ZTE was fined $1.1bn (£800m) after admitting, in March 2017, to violating US sanctions by illegally shipping American technology to Iran and North Korea. The current export ban - which lasts seven years - was imposed last month after the company allegedly failed to comply with its agreement. Mr Trump re-opened the issue with a Tweet on Sunday, saying jobs in China were at risk. Douglas Jacobson, a lawyer in Washington DC who represents some of ZTE's suppliers, said: "This is a fascinating development in a highly unusual case that has gone from a sanctions and export control case to a geopolitical one. "There's no legal mechanism for this. How this will play out remains to be seen. They are not simply going to be able to resume business as usual." Is Donald Trump on the defensive? The about-face has prompted questions from critics in the US. US Senator Marco Rubio, a Republican who competed against Mr Trump in the 2016 presidential campaign, wrote: "I hope this isn't the beginning of backing down to China." US Senator Chuck Schumer, who leads Democrats in the Senate, said the move raised concerns that the president will not stand strong against China on the question of intellectual property. He said: "This leads to the greatest worry, which is that the president will back off on what China fears most - a crackdown on intellectual property theft - in exchange for buying some goods in the short run. That's a bad deal if there ever was one."